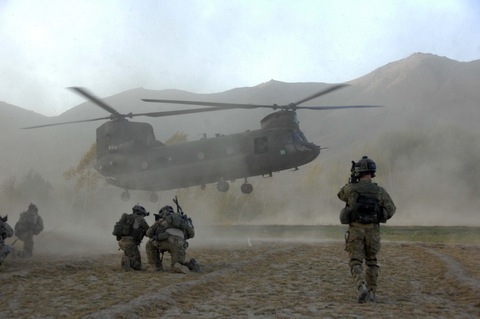 U.S. soldiers in Afghanistan in 2009. Photo by Army Spc. Walter Reeves. Most projections indicate that the United States is on an unsustainable fiscal path under the current federal tax and entitlement regimes. Absent fundamental reforms, many experts suggest that the nation’s rising debt poses a great long-term threat to U.S. national security, and that the Pentagon’s budget will eventually be crowded out by mandatory social spending programs. Over the last few years, Washington has debated various deficit reduction proposals, but a major legislative compromise has proved elusive. Without an agreement by March 1, automatic budget reductions, known as sequestration, will go into effect. For fiscal year 2013 (FY2013), the cuts will total $85 billion, half of which falls on defense. While many analysts believe some defense cuts should be part of a comprehensive deficit reduction accord, they fear that the sweeping fiscal austerity scheduled to begin in March 2013 would needlessly undermine national security. Others say such concerns are overstated, noting that even if all the scheduled reductions occur, defense spending would still fall within recent norms. How would the budget sequester process work? The automatic budget reductions are a conditional enforcement measure included in a deal that Congress reached in the summer of 2011, known as the Budget Control Act (BCA). The bill balanced a $2.1 trillion staged increase in the government’s borrowing capacity with matching deficit reductions stretched out over a decade. Specifically, the statute placed roughly $1 trillion worth of caps on all discretionary spending through FY2021, and stipulated that if Congress was unable to identify by January 2012 an additional $1.2 trillion in reductions for this period, budget austerity of an equal amount would come into effect automatically. Congress missed its deadline and triggered a sequester set to take effect March 1. The sequester activates two changes to the original BCA spending caps: it apportions them evenly between defense and non-defense budget functions, and it lowers their levels by an additional $109 billion per year for the eight sequester years (FY2014 – FY2021) to achieve the mandated savings. FY2013, as noted below, is handled differently. If no superseding legislation is passed in the next nine years, base funding for the Pentagon would be roughly $500 billion less than it would have been if it simply increased with inflation starting from FY2012 to FY2021. How could the reductions affect U.S. national security? The Defense Department is set to incur roughly $46 billion in FY2013 spending reductions, or about 9 percent of its base budget, under the sequester. Unlike subsequent sequester years (FY2014 – FY2021), this year’s reductions will be made proportionally across the board to each individual discretionary defense program, a so-called “meat axe” approach that offers little flexibility for planners to target cuts. Furthermore, because the Pentagon is operating under a stopgap spending measure known as a continuing resolution, or CR, FY2013 cuts will be spaced over an abbreviated seven-month time period (through September) that will likely exacerbate the process. A CR provides military leaders with little flexibility to shift money around to meet changing needs, and many officials fear that political gridlock will force Congress to simply extend this makeshift funding for the rest of FY2013. As a result, some analysts suggest that March 27, the expiration date of the current CR, is the “real deadline” for preventative legislative action. In late February 2013, Pentagon comptroller Robert F. Hale said within a year, two-thirds of Army combat brigade teams would be at “unacceptable” readiness levels, as would most undeployed Air Force units. Navy and Marine officials say that fleet operations and depot maintenance would suffer immediately, including reduced flight operations and deployment cancellations. Hale said the department was already taking anticipatory measures, including slowing spending, freezing hiring, laying off temporary staff, and cutting back at bases. Nearly all programs would be cut, he said, and the majority of the department’s 800,000 civilian personnel would be furloughed for some period starting in late April 2013. The longer the Pentagon is made to operate with reduced resources, the greater the impact on its ability to project power abroad, protect U.S. interests, safeguard the global commons, and provide humanitarian aid. Protracted budget uncertainty, defense analysts say, inhibits the department’s ability to make the investment decisions, such as for R&D and procurement, needed in a security environment that requires long-term strategic thinking. As an example of what’s at stake, some defense analysts note the Navy’s recent decision to cancel the deployment of the USS Harry Truman, an aircraft carrier previously destined for the Mideast. With the decision, the service effectively chose to sacrifice current deployment expenses for the benefit of future funding for multi-year shipbuilding programs. In effect, this means only one aircraft carrier will be operating in the Persian Gulf, where tensions with Iran have heightened in recent months. Are there defense-related domestic consequences? What happens at the Pentagon inevitably plays out in the state and local economies that host U.S. military installations and contractors, communities that benefit from both defense industry jobs and spending. Analysts note, of course, that these effects would take time to permeate out into the broader economy. A $46 billion reduction in defense outlays for FY2013 would account for a decline of roughly 0.3 percent of GDP. Economists say this amount is significant in an economy expanding at just 2 percent a year. A 22 percent drop in military spending in the fourth quarter of 2012 played a considerable role in the 0.1 percent contraction in GDP, the worst quarter since the end of the recession. A report by the National Association of Manufacturers, an industry group, says that more than a million private sector jobs will be lost in FY2014 under sequestration. The five states that would suffer the greatest are California (148,400), Virginia (114,900), Texas (109,000), Florida (56,600), and New York (42,100). 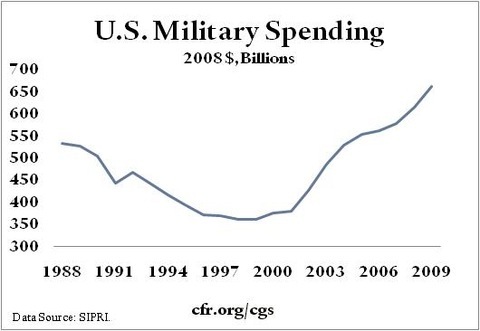 Are major defense cuts necessary without sequester? Many analysts say the warnings from the Pentagon and some Republican lawmakers regarding the sequester are overblown, noting that even with the additional budget reductions, defense would still be funded close to what it was in FY2007. Furthermore, they say that if war funding was also phased out in the coming years, the reductions would remain in the range of similar drawdowns after the Korean and Vietnam Wars. However, most observers agree that the blunt manner with which sequestration achieves its cuts are ill-advised. “The process and timing of sequestration as it stands today would take a serious toll on our military,” writes defense expert Larry Korb for CNN. “That’s too bad. Because the idea of reducing defense spending by $500 billion over the next 10 years is a good one.” He says Congress would do better to phase in the cuts more gradually, allowing the Pentagon to make the tough choices he says it has avoided as its budget soared after 9/11. 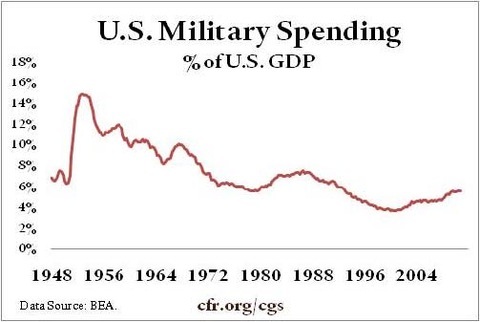 Conversely, opponents of cuts in military spending often cite the fact that as a percentage of the total economy, U.S. spending has steadily declined over the past sixty years. Moreover, they say a host of emerging threats such as China, Iran, and North Korea require sustained funding levels. How does the U.S. defense budget compare internationally? The United States spends nearly as much on its military as the rest of the world combined. Not including war costs, the Pentagon spends roughly five times as much as China’s $114.3 billion (2010) and ten times as much as Russia’s $52.6 billion (2010), according to the SIPRI Military database. In Europe, aggregate defense spending has dropped to less than half that of the United States. In addition, the Pentagon accounts for 75 percent of all NATO defense spending, up from half during the Cold War. The Obama administration has warned NATO members this funding arrangement is unsustainable. What is the long-term outlook for defense spending? Defense spending represents about 20 percent of the total federal budget and nearly 60 percent of discretionary spending– the portion of the budget not automatically allocated to entitlement programs such as Medicare, Medicaid, and Social Security. The soaring costs of health care and an aging U.S. population will direct a growing portion of the federal budget to these three entitlements (PDF), which already account for more than 40 percent of total federal outlays.